Are any of you as shocked as I am? Life moves so fast, and I am reminding myself to savor the everyday every day. I've been playing around with my new computer and really enjoy having a Mac again. I named the new laptop MacArthur and didn't let it stay naked for too long. The second I saw this Kelly Rae Roberts laptop skin, I had to order it. I also ordered one for my cousin Cindy that says Dream Big. Looks like they're selling quickly, so you may want to check out the shop now. I also got Adobe Design Suite, even though I'm not too skilled in Photoshop & Illustrator. It's been a fun learning experience, especially with the high number of companies that offer tutorials and freebies online. I don't know why it's taken me so long to find Pugly Pixel- what a fantastic site. 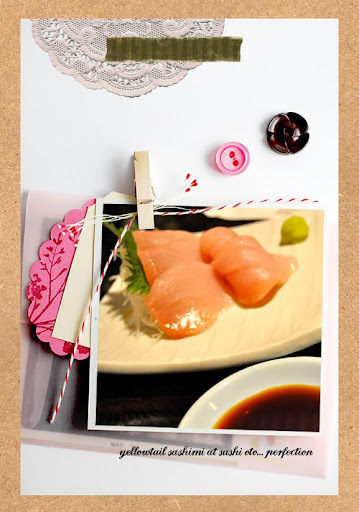 I downloaded 9 photo overlays and used a photo of our amazing yellowtail sashimi at Sushi Ota. If you love sushi and are in San Diego, you must try this place. Call for a reservation though, the place is popular for a very good reason. And I must have been slightly delirious when making this page as I spelled the name of the venue wrong. O - well, the sushi's perfect, I am not. Happy Monday!